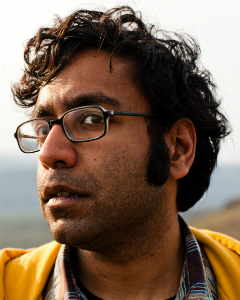 Hari Kondabolu is a Brooklyn-based, Queens-raised comic who has been described by Timeout NY as “smart, analytical and rising.” He has performed on Jimmy Kimmel Live, Comedy Central’s Live at Gotham and John Oliver’s New York Standup Show and the 2007 HBO U.S. Comedy Arts Festival. His Comedy Central Presents half-hour television special debuted on the network in February 2011. He is currently a writer for FX’s Totally Biased with W. Kamau Bell, set to make its debut in August 2012. He will also be appearing on the third season of John Oliver’s New York Standup this summer. He made his UK television debut on BBC 3’s Russell Howard’s Good News in April 2011, which preceded a month-long run at the Edinburgh Fringe Festival. He then had a regular segment on the first series of BBC3′s “Live at the Electric” starring Russell Kane. He has also appeared on Episode 69 (Live Portland Super Show) of WTF with Marc Maron. When in New York City, he co-hosts the mostly improvised, monthly talk show The Untitled Kondabolu Brothers Project with his younger brother Ashok (“Dap” from hip hop group Das Racist). He also wrote the cover story for Spin Magazine about Das Racist last November.